This small variegated tree boasts pretty lobed foliage that emerges pink, turning to green with creamy white margins. The foliage of this ornamental tree is small and bright, making this tree ideal for a dingy corner. The Autumn colour of Acer Campestre Carnival is equally interesting in buttery yellow with creamy white margins. Its winged seeds, often compared to little helicopters, are similar to most maple trees and yellow-green clusters of slightly upright flowers appear in spring. This small ornamental tree will grow well in most positions but to avoid scorching by the sun, allow it some shade where possible. The Variegated Field Maple will grow into a bushy, lolly-pop shaped tree that can be pruned into a neater form if desired. Overall this is a very versatile small ornamental tree that will grow to 3 x 2 metres in 20 years. Our pot grown 'Carnival' Field Maple trees can be planted at any time of the year. Prepare your planting site by removing weeds and grass within a metre of your desired planting hole. Dig a square hole as deep as the root mass and roughly 2x as wide. To help the tree establish more effectively, sprinkle root grow in the hole. 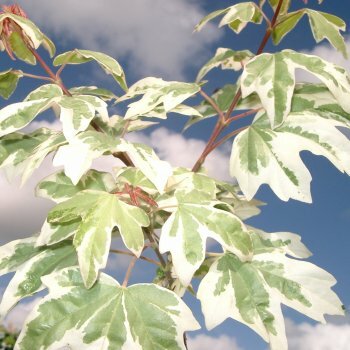 We recommend planting 'Carnival' Variegated Field Maple trees with a staking kit. For single stakes, knock the stake in at an angle and use a buckle tie with a spacer to prevent chaffing. For more advice, visit the help section. If you’re planting Variegated Field Maple trees in spring or summer, water well for the first few months. Increase watering if there are extended periods of hot or dry weather. If planting in autumn, you may only need to water a little.